Currently being between jobs, I figured that I should use some of my available time to tweak my home network and brush up on some skills whilst waiting for companies to get back to me. A while back, I replaced the router provided by my ISP with one that is basically better. After getting it setup, I soon realized that it lacked one useful feature that my previous router did. It didn’t automatically register devices in a local DNS. This was a bit of a pain so I decided to use my Synology NAS as a DNS server, as it has a package for it. I did a very rough-and-ready job at the time, just to basically store a few local addresses and forward the rest via my router to my ISP. No reverse-lookup functionality on the internal network, though. This was all very well for a while. It did the basic job and was certainly “good enough” for a home network. However, with jobseeking taking longer than I would like and me starting to run out of things to fill the hours with, I figured that now was the time to do a proper job of it. Finish it off so it all works nicely, even if it’s a bit overkill for a home network, and to actually increase my knowledge of how DHCP and DNS work. After all, even when I am in work, I’ve never really had the opportunity to get into the network. And even if I had, playing around with a live network just to see how it works is very much a Bad Idea. Potentially breaking my single-user home network to improve it and learn how it works is a more acceptable risk. DHCP (dynamic assigning of IP addresses) is done on the Router. I have set registered addresses for much of my home equipment. In some ways this is overkill, but it can be useful. It means that my at-home network has fixed IP addresses for various devices but I can bring them elsewhere and have them “just work”. A very entry-level managed switch. My NAS is running a DNS server, which the Router is set to give out as the main DNS server for my home network. The DNS server will query external hostnames via my ISP’s main DNS servers but for anything on the internal-only domain, these are stored on the NAS. A few (not all) bits of home gear. Reverse DNS lookup is now implemented. Up until now, I could only query an internal hostname to get its IP address. Now I can also query the IP address to get the resulting hostname. Not really essential on a home network but if I’m going to implement DNS at home, I might as well do it properly. This is a step forward from what I had but still not perfect. If I have to reboot/update the NAS, or it breaks, I lose DNS resolution. Including for external sites. Not really an idea situation. After this, I plan to implement a secondary DNS server elsewhere on the network. I am either going to use a small VM (Virtual Machine) running on the Proxmox host to run this or I shall use an old Raspberry Pi I have lying around. The latter is underpowered for any heavy lifting these days but as a backup DNS it would probably do fine. All in all, it’s a little bit more complex than a small home network needs to be. However, it does leave everything a little more robust than just leaving it to the router. Aside from that, the past couple of days’ geekery has given me a lot more insight into DHCP and DNS. I’d say it was definitely worth the effort. Recently I have been playing a Playstation3 game called Ar Nosurge: Ode to an Unborn Star. It was made by Japanese games company Gust as a distant prequel to its Ar Tonelico series. I am closing in on the end of the game, now, but it is starting to leave a bad taste in my mouth. There is no single, large fault with the game. There have been, however, a lot of small issues which, overall, begin to stack up against it. I also need to note that, unlike previous Gust games, newer releases like this one are localised and brought to the West by Koei Tecmo (as their Japanese arm now owns Gust), instead of Nisa. This isn’t necessarily a bad thing, or the cause of the problems. It does mean, though, that current and future Gust games are being brought t the West by a company that doesn’t yet have a long history with the ongoing franchises. In Japan, this game is the second in the Surge Concerto series. The first game, Ciel Nosurge, was a Playstation Vita game with online connectivity where you get to know the character Ion and a long and involved history of the setting and characters of this series. This online data, then, could be imported into Ar Nosurge and somewhat affect how Ion’s story unfolds in the second game. It was decided, for whatever reason, not to bring this outside of Japan. Perhaps they out that the “Life Simulation” concept wouldn’t work well for a Western audience. The problem, though, is that we are left with the second part of a story which is intricately built up and prepared in the part we don’t get over here. You need to find a story guide to get a good feel of what is going. and which people knew who. I, for one, was very confused initially when Ion knew characters from the other playable group of characters because I didn’t yet know that they had all grown up together. Aside from the pure story side of things, the online component of Ar Nosurge was taken out, as it had no counterpart data to play with, removing an optional boss and removing the ability to unlock a costume change function. Minor but annoying. No explanation, as far as I can tell, was made regarding why this choice was made. If there was one, it is hard to track down. The English language localization was problematic. Names and terms were translated inconsistently, as if only half of the people rewriting the text were given the final canon spellings and terms. NPC dialogue was also hopelessly mangled. Sentences were spoken out of order and possibly by the wrong people. It also, apparently, didn’t get much of a testing phase before the non-Japanese release, so none of these issues were picked up. This is where it started to all fall apart. Players all began to bring this to the attention to the American and European arms of Koei Tecmo. There was not a huge amount of communication coming back, though. The American arm, without mentioning specific flaws, put out a feedback questionnaire. The European arm would respon directly to people but did not put out a public notice addressing these issues. This week, on Wednesday November 12th, the silence was broken. Koei Tecmo Europe announced that a patch was “scheduled”. This was vague, as it didn’t state whether it meant work was just starting on it or if it was nearing completion. Koei Tecmo America then announced that the patch was out in the American regions. It wasn’t until Friday, after a bit of hassling towards them, that Koei Tecmo Europe finally mentioned something at really needed to be said in the first place. The patch has been submitted to Sony Europe and is currently awaiting approval and release. A lot of tempers could have been kept is this had only been said from the outset. The real problem I have with this whole release is that there have been several minor issues, all of which could have been contained by much better communication. By ignoring requests for clarification and giving late information and pleas for “patience and understanding” long after people were annoyed, they themselves helped the situation escalate from something minor into something more. We hear the feedback and are passing it along to the developers. The text issues in the game are being addressed. We will let you know when a fix is close to release. The patch has now been completed and submitted for approval. The release will likely be staggered by regional approval processes but work is complete and the fixes should be live to everyone before too long. Just a little bit more openness, at all stages of the situation, would have saved a lot of hassle. Instead, I am finding my enjoyment of a good game somewhat marred by treatment of its international release. Digital comics platform ComiXology recently made a very sudden change to its operating model. On Saturday April 26th 2014 the in-app storefronts stopped working, with absolutely no prior warning that this was going to happen. Android users required an update, which replaced the old Google Play compatible storefront with one requiring their main ComiXology account have a payment method on file. Aside from the inability to use Google play credit anymore (which is a major issue for some) there was no real loss in functionality. As long as one is in a position to use the credit card or PayPal account. …in the shiny new Reader-Only App. The poor PR and tech support (file migration was not always smooth) guys must’ve been working their socks off last weekend to deal with the aftermath of this one. ComiXology have desperately been trying to put a positive spin on this as being ultimately good for the customers. Apple’s App Store does, it has to be said, have rather strict rules regarlding in-app purchases. Apple automatically get a 30% cut of each sale. Also, there are rules regarding what kind of content is allowed to be purchased in-app. So technically this is a good change. Only the web store was always an option before. So if people wanted restricted content then they could do. And if someone wanted to support ComiXology directly, they always had that option. The problem now is that choice has been taken away. You must use the webstore if you are an iOS user. You must buy directly through ComiXology, regardless of tablet platform. If you favour in-app purchases, or if you only run through mobile store credit, you no longer have those options. Needless to say, it has been a bit of a PR disaster for them. Their App Store average ratings (depending on country) have dropped to between one Star and one-and-a-half Stars. People are deleting the app. People are unsubscribing from other Amazon services, or at least taking the opportunity to review whether they need those subscriptions at the moment or not. And the very people who probably would have been won over in a day or so have been alienated by the overall bad handling of the whole situation. They have severely negatively impacted their customer loyalty. There’s a chance it may just be a case of “Nerd Rage” and that it will all settle down quickly. There’s always that chance, though, that this is going to leave people with a sour taste for a long while yet. Only time (and sales figures) will tell. I’ve just worked out a quick comparison of the four main anime streaming options available in the UK. I have linked each service’s name to their service information or FAQ pages. I have taken information as available from their websites. Where I am unable to get a definitive details, I have marked it as such. Animax has just announced that paid subscribers no longer get adverts for simulcast episodes. Two months ago I posted a brief overview of Animax’s Anime streaming service as they had finally released their first non-web platform, their PS3 app. Since then, there have been a few improvements. Their main website’s front page actually lists the series title as well as episode title when mentioning their latest releases. And the PS3 app does now respond properly to the media remote. So they are clearly making improvements, and ones based on customer feedback at that. My problem, though, is that the improvement aren’t happening fast enough. The website and PS3 app are still less than ideal, and there aren’t any other apps out yet. There is still no queue/watchlist feature. There are still adverts for paid subscribers and there are still delays in episodes being release. Anywhere from a day or two to a full week behind when Crunchyroll release the episodes to their regions. And, yes, all this for a higher price per month than Crunchyroll’s Anime-only subscription. At this point in time, I cannot really recommend this service. Not unless someone is desperate to watch the shows they have via legal means. The really sad thing is that, this season like other seasons, some of Animax’s UK licenses (Mekaku City Actors and The Kawai Complex Guide to Manors and Hostel Behavior, a.k.a. Bokura wa Minna Kawaisou) are shows that CR has the except-UK rights for. And they are releasing them on time, and on multiple platforms and ad-free for paid members. I want to like this latest entry to the UK Anime Streaming scene but, really, I just can’t. They are now into their third season of mishandling shows that Crunchyroll are doing a good job of elsewhere. Without some serious improvements, and fast, they really need to stop picking up the rights to what would other be Crunchyroll’s catalogue. I hate to say it. I’m known for speaking my mind, though, so I’m not going to hold back just because I wish the situation was otherwise. Animax still have a long, long way to go. And, going by other people’s opinions online, very little time left to get there. Well, what with all the Heartbleed shenanigans going on at the moment, there are many of us faced with the daunting task of changing all of our passwords. Just to be safe, plus it is good practice to change them at least occasionally, Y’know? I have also seen people talk of various password management solutions. So I thought it was as good a time as any to mention what I use. When I was looking into solutions last year, I wanted something that wasn’t tied to any one single online service. yet I still wanted something that I could keep updated between multiple devices and platforms. Individual safes are encrypted, preferable with a secure/long passphrase. Even if no encryption is perfect, it still beats a plaintext file, a nice open notebook, or post-its at the monitor. Accounts can be stored in groups and subgroups. By default, account details open with the password and notes fields masked out, to stop shoulder-snoopers. But you can toggle them to visible as and when required. The main program and the compatible apps (the ones I’ve tried, anyway) allow the copying of any account (username, password, etc) to the clipboard for easy entry. Passwords are cleared form the clipboard after a period of time. PWSafe, at least, allows you to set the duration. You can set an account entry to remember a certain amount of passwords, should you need it. it gives a timestamp of when you created and last changed any given password. Random passwords can be generated within the apps. In addition to this, PWSafe can use safes that are either local to the computer/device or online via either iCloud or Dropbox. Or you can just manually copy the safe file between computers and devices. 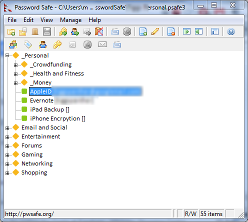 PWSafe on my Mac, iPad and iPhone. Safes stored and synced via iCloud. Periodic manual copy between the Mac’s local iCloud folder and my Google Drive folder. Windows installation of Password Safe pointed at the Google Drive copy of the safes. For anyone with an Android device, I was looking into this as well when borrowing an Android tablet recently. There is a Password Safe compatible app with an accompanying sync tool that, amongst other services, can talk to a Google Drive account. Unless you are purely Apple based or purely on an internal system (where you could point/sync multiple computers to a shared network location) it does require a little bit of manual interaction to work across devices. However, it does give me the freedom of not being locked into one particular site. And the bit of effort needed is well worth the convenience of pretty relatively secure password manager synced between platforms.